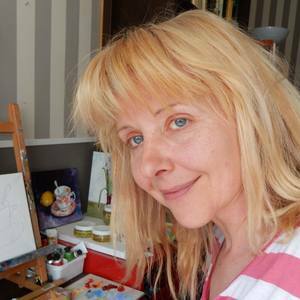 Hello, My name is Vita Schagen, and I am an artist living in Amsterdam (Netherlands). More than anything else I love to paint portraits of different people. I think people are the most mysterious creatures in this world, and I want to capture their life, their emotions, their dreams, their love, their soul, in my work. I also like to do still life, landscapes and all other kinds of things that are around us everywhere in everyday life. I don't think about labeling my work as any art style; what is important to me is that my paintings reach into your heart in unexpected ways, that they make you smile or be surprised. I use different styles of painting; it depends on my mood, the subject I want to paint, and what kind of emotions I want to show. I have been interested in art and painting ever since I was a young girl. I went to art school when I was 18, but when I finished the economic situation in my country was very different stuff on their mind then art, so I had to earn my money in business. I created several companies, but art was never far from my mind and I tried to incorporate it in my business life. I had most success with this when I launched a combined vintage/antique gallery and shop in Moscow 10 years ago. One day I decided to hang my pictures on the wall, just for decoration. I was very surprised about the response I got; people liked them, and actually wanted to buy them. It was a huge boost to my confidence as an artist. I am very happy now with the response I am getting and the interest of people in my work. I am very proud that my paintings are travelling to all corners of the world, such as USA, France, England, Australia, Russia, Canada, et cetera. It gives me so much inspiration and confidence to do what I always wanted to do. I usually work with oil paint. I always use fine art materials for paint, canvas, brushes, etcetera, to ensure the best quality. I am always happy to discuss the commissions. Thanks for stopping by for a look at my paintings, I hope you enjoy them.